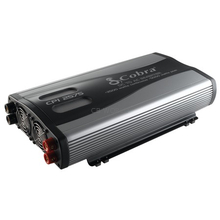 This 12 Volt DC To 120 Volt AC Power Inverter Features 2500 Watts Continuous Power Handling, 5000 Watts Peak, 5 Volt USB Output, Modified Sine Wave, Thermal Shutdown, Reverse Polarity Protection, Low Voltage Shutdown, Low Voltage Alarm, 3 Grounded AC Receptacles, LED Volt/Watt Meter, And Remote On/Off Capable. Installation Requires Power Cables. Cobra CPIA4000BC Power Cable Recommended. Remote Control Option, Model CPIA20 Avaliable.